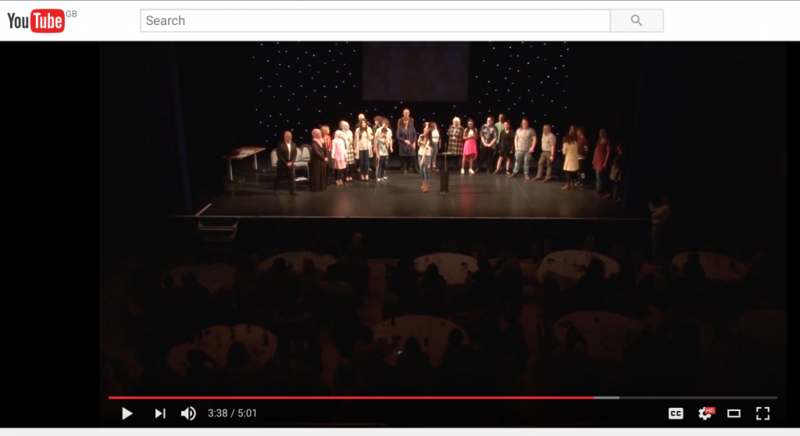 I’ve posted here previously about the really successful young people’s project that we (All Across The Arts) ran in Rochdale culminating with a super event at the Middleton Arena. Today I’m posting a link to the short video about the project. The narration is by project organiser Steve Cooke and the video shows the kind of work and benefits we were able to deliver for a very diverse group of young people by giving them the tools and the support they needed to tell their own stories in the best way to suit them. The gains in confidence and skills by the young people were highly visible as was the development of their social skills. The team members Steve, Rebecca Whitehead, John Cooke, Ray Stearn and myself all found the project inspiring and rewarding and the venue, Vibe Youth Music in Rochdale, enabled all of the work to be carried out in a safe, comfortable environment with studio facilities for discussions, composing, recording etc. Aside from my role as poet I also surprised myself when asked to produce the video. I’ve recorded video often enough before but recording sound and editing to add still images, subtitles and content from PowerPoint was all new to me. I loaded some suitable video and audio software and set to learning in order to produce the finished work; this was just one of area where the project helped me to develop.